Aleppo’s children are the victims of the ongoing fighting: among them school children in the government-controlled west of the city and a girl in a rebel-held district in the east. November 20 was a bloody Sunday in the western neighbourhood of al-Farqan. A rebel bombardment killed at least eight school children aged between six and ten. The attack also killed two adults and injured 70 people. Aleppo has become a battlefield where the government which holds western districts are fighting rebels which are surrounded in the eastern districts. Some 250,000 people have been besieged in the east of Aleppo for four months. Last Tuesday (November 15) Syrian state TV said government warplanes had taken part in strikes against terrorist strongholds. The World Health Organisation reported that there were no working hospitals left, due to the relentless bombing in the east. Footage from the Aleppo Media Centre purported to show the aftermath of a missile strike on one of Aleppo’s eastern hospitals. Rescue teams had succeeded in making them work, but now lack of supplies make it almost impossible. 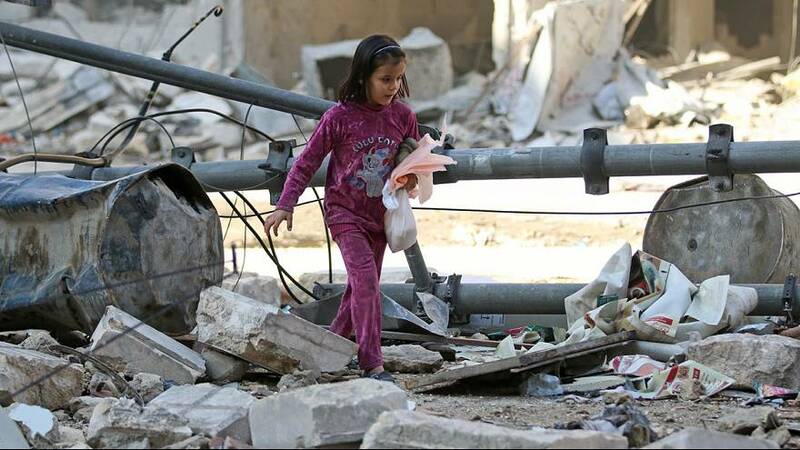 On Sunday (November 20) a barrel bomb killed a family of six in the east. Two medics say the family had suffocated because the explosive had been laced with chlorine gas. Moscow had previously claimed that militants in eastern Aleppo have used chlorine as a chemical warfare agent.